Stem: spreading to erect, 3--10 dm. Leaf: sheath generally glabrous; ligule (2)5--7 mm, jagged with age. Inflorescence: branches spreading to ascending, lower 8--15 cm. 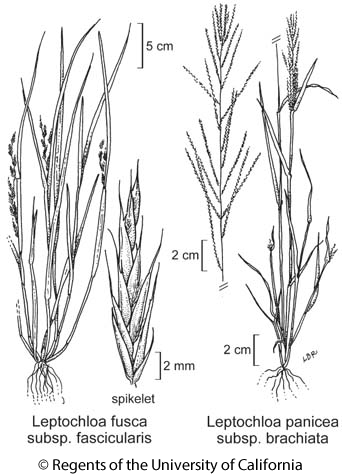 Spikelet: 6--12 mm; glumes 2--4 mm, lower lanceolate, upper > and wider than lower; florets 6--12, +- white; lemma 3.5--5 mm, lanceolate, often with dark spot on lower 1/2, awn at tip 1--3(5) mm. Chromosomes: 2n=20. Ecology: Marshes, wetlands, often wet disturbed areas, often associated with agriculture; Elevation: < 1200 m. Bioregional Distribution: NCoRO, GV, CCo, GB, D; Distribution Outside California: to eastern United States, Mexico, South America. Flowering Time: Jun--Oct Note: Generally self-pollinating. Citation for this treatment: James P. Smith, Jr. 2012, Leptochloa fusca subsp. fascicularis, in Jepson Flora Project (eds.) Jepson eFlora, http://ucjeps.berkeley.edu/eflora/eflora_display.php?tid=80525, accessed on April 20, 2019. NCoRO, GV, CCo, GB, D; Markers link to CCH specimen records. Yellow markers indicate records that may provide evidence for eFlora range revision or may have georeferencing or identification issues. Purple markers indicate specimens collected from a garden, greenhouse, or other non-wild location.